BACKGROUND:Erythropoietin (EPO) is a part of an endogenous neuroprotective system in the brain and may address pathophysiological mechanisms in progressive multiple sclerosis (MS). OBJECTIVE:To evaluate a treatment effect of EPO on progressive MS.
METHODS:This was a single-center, randomized, double-blind, placebo-controlled phase 2 trial, in which 52 patients with secondary or primary progressive MS were allocated to treatment with recombinant EPO (48,000 IU) or placebo, administered intravenously 17 times during 24 weeks. Patients had an Expanded Disability Status Score (EDSS) from 4 to 6.5 and clinical progression without relapses in the 2 preceding years. The primary outcome was the change in a composite measure of maximum gait distance, hand dexterity, and cognition from baseline to 24 weeks. RESULTS:A total of 50 patients completed the study. Venesection was performed often but no thromboembolic events occurred. We found no difference in the primary outcome between the EPO and the placebo group using the intention-to-treat principle (p = 0.22). None of the secondary outcomes, neither clinical nor magnetic resonance imaging (MRI) measures showed any significant differences. 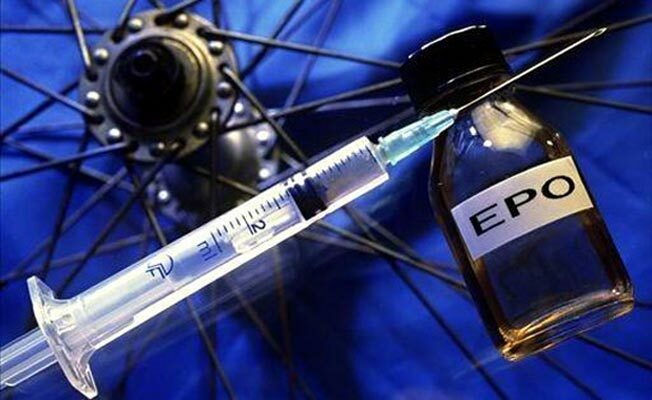 CONCLUSION: This study provides class II evidence that treatment with high-dose EPO is not an effective treatment in patients with moderately advanced progressive MS.
As Rio 2016 gets underway, cycling’s favourite drug of abuse (approved by Lance:-() rejected by British cyclists) gets used in MS. The drug makes red blood cells so that you can take up more oxygen and have more cell energy, but it has been reported to be neuroprotective. This study examine an effect on hand function but it was a 6 month study, so the chances of seeing efficacy must be minimal, which is what they got. Speaking of doping and MS the other hand, I know many men MSers who are doing MSers replacement testosterone, athletes or not. One of them even says feel less fatigue, which is one of its symptoms/sequelas most disabling. He reported that his neuro asked tests to see if testosterone would be interfering in the Cholesterol synthesis and its levels.